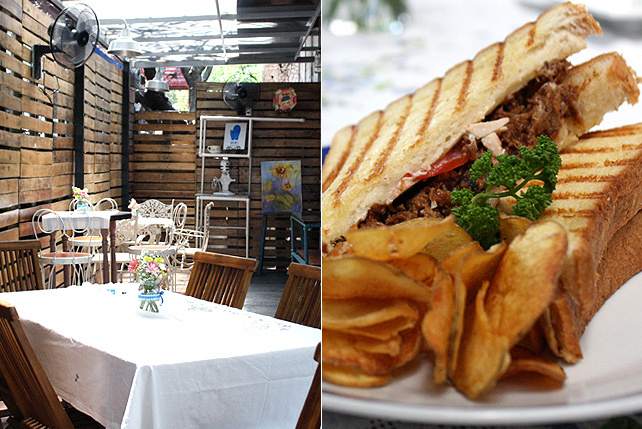 This summery hideaway in Makati is the sweetest spot for home-cooked meals and great desserts. (SPOT.ph) Somewhere, past SoFA (from Gil Puyat), is a compound that partially obscures the tiny sign that announces the existence of Nikko's Baking Studio. You'll wonder if you're in the right place. What kind of restaurant could hide itself behind parked cars on one of Makati's busier streets where stopping or slowing down is a fury of honking horns or unsympathetic speeding? We need more restaurants like this. The table in the corner is the date spot. The answer, behind a white minivan and a rather imposing plant, is a veranda. 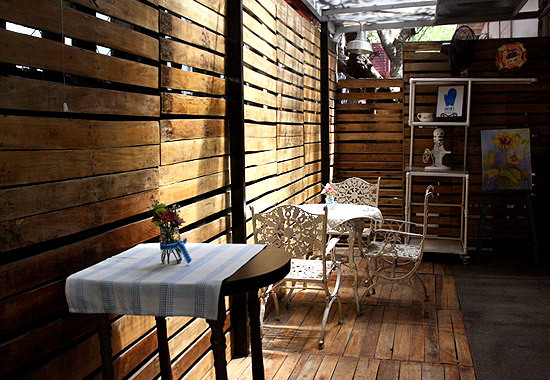 A photogenic scenery of distressed blonde wood, where mismatched patio furniture completes the picture. Nikko's Baking Studio is like an excursion to someone's home-a breezy summer one-with an effortlessly pretty backyard. Theirs, in fact. Niño Buendia, Nikko's younger brother, points at some of the chairs. "That's from our house." The others, he reveals, are from their aunt's. The pretty bird napkin holder is something their mother still begrudges the chef for taking. 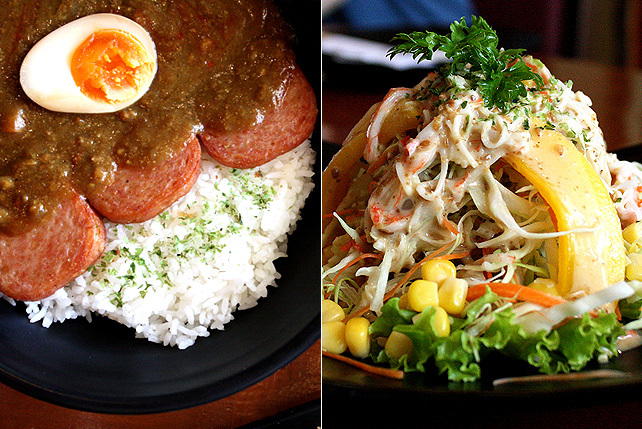 Yes, a meal at Nikko's Baking Studio is like an invitation to lunch with their family. "These are the things we eat," says Chef Nikko. 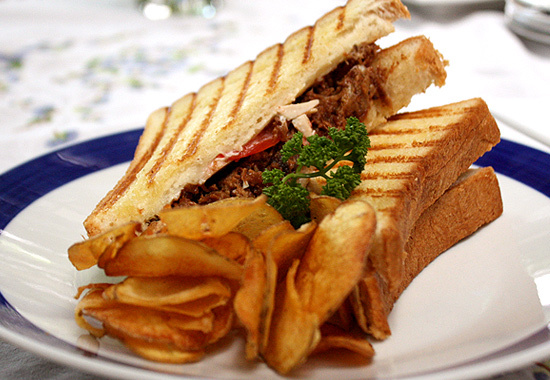 The Ultimate Grilled Cheese Sandwich (P290), for example, was created for Niño. 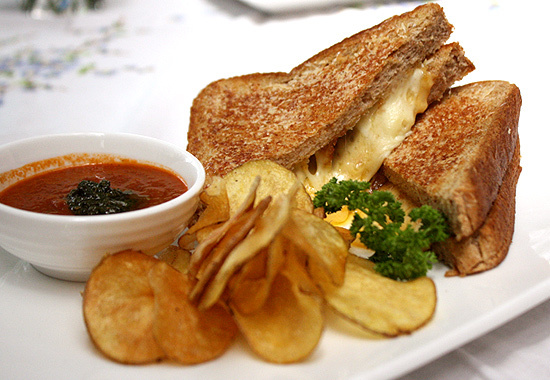 Six types of cheese make up the bright yellow oozing out between slices of wheat bread. It looks very nearly like the mouthwatering grilled cheese in Chef, except we didn't see Chef Casper (Jon Favreau) pepper his with Parmesan. The rest is a rowdy match where American cheese, mozzarella, Gouda, and Gorgonzola opine their own unique flavor. The Martie’s Flaky Tapa (P280), her daughter's favorite, is a wondrous thing. 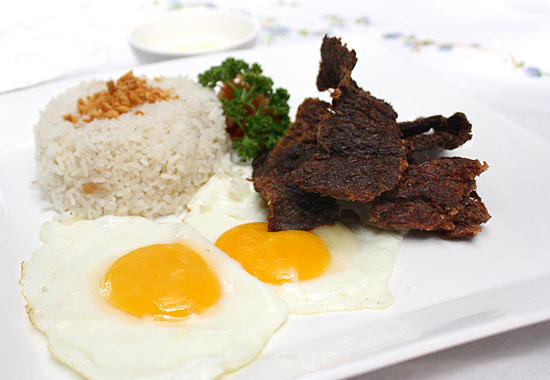 Rice, a pair of perfect sunny side-up eggs, and slices of dark-brown beef over pretty floral plates (like the ones you have in your kitchen) hints at the usual, but the tapa is cracker-crisp. Like crunchy bacon. Or chicharon. 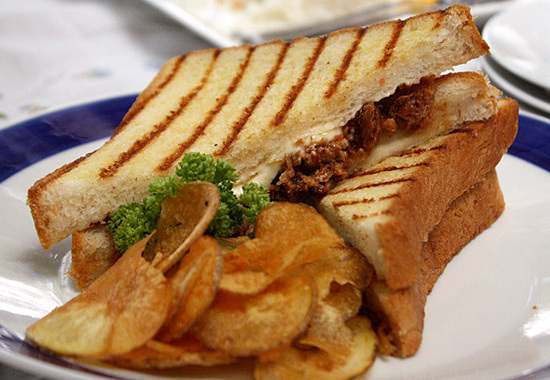 Or unthreaded adobo flakes (actual adobo flakes make appearances in two sandwiches-one with delightful kesong puti and another with rich red eggs). Down-home cooking is the emphasis at Nikko's Baking Studio, but it's these nuances that will have you scratching your head, thinking why what you make at home isn't quite the same. Chef Nikko has a knack for bringing out just the right amount of flavor. 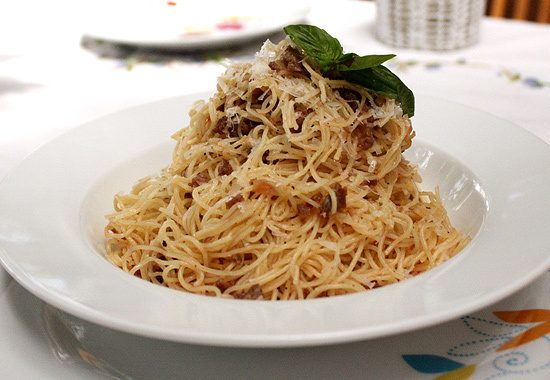 Lucban longganisa, which can be overwhelming in wrong doses, is skinned, crushed, and tossed into delicate angel-hair pasta and olive oil, developing a light but distinct paint of that garlicky flavor. 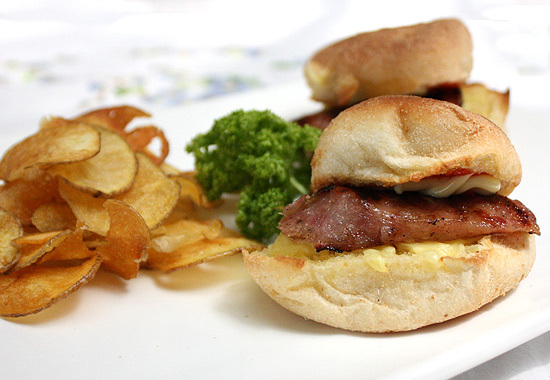 She found chorizo used for those famous Boracay Chori-Burgers, and she fashions her version like our old favorite baon: in pan de sal and with cheese, it doesn't taste like the desperately sweet burgers we used to eat at the beach. Chef Nikko's best skills come out with sugar, flour, eggs, and an oven. She's one of the chefs who sent cakes for the Papal staff for their flight back to Rome. In her case, it was Mocha with swirly frosting and dainty sugar flowers. A slice is a time warp to our seventh birthday party where cakes were modest, soft, and moist underneath that coat of not-so-sweet icing and adorable sugar flowers. 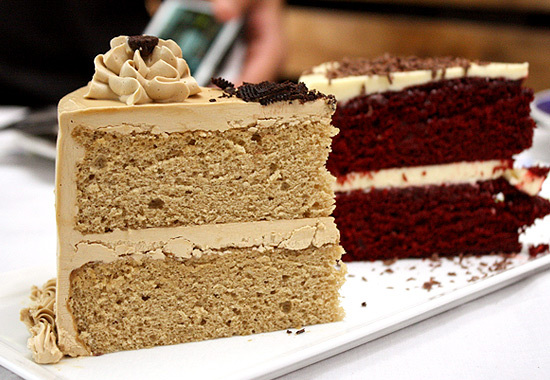 It's simple, but something of a relief from today's sculptural cake standards. It’s also great with their Barako drip coffee (P75) from Batangas. 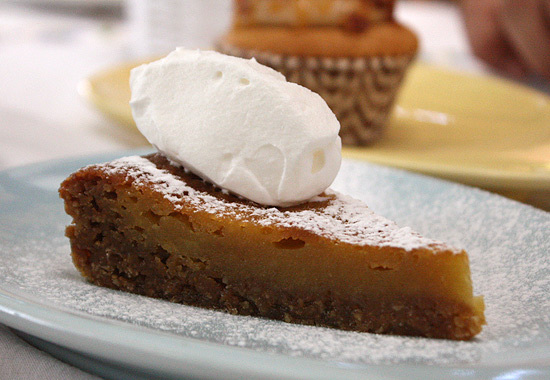 The Crack Pie is a demonstration of what butter, sugar, and flour could turn out in more capable hands. 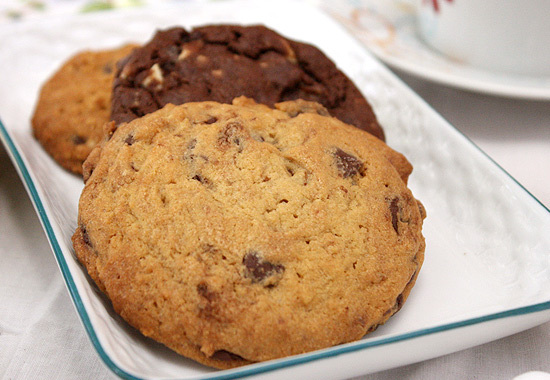 The fragile crust is a chewy base of rolled oats while the filling flaunts mellow sweetness. 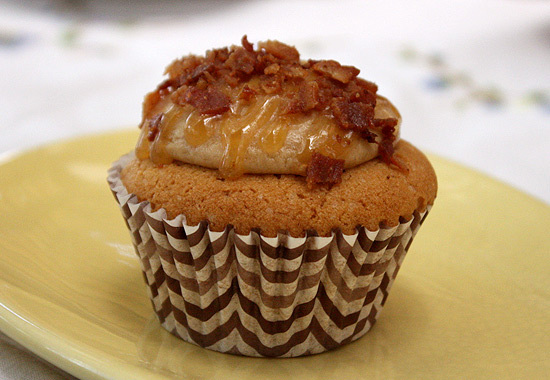 All this lightness is canceled out, however, by the Peanut Butter and Bacon Cupcake , a request from Niño who loves his nutty spread. It's a dense little treat, the peanut flavor unmistakable-punchy, in fact-and the fragments of bacon on top are impressively crunchy. Bacon bits, apparently, are banned here. 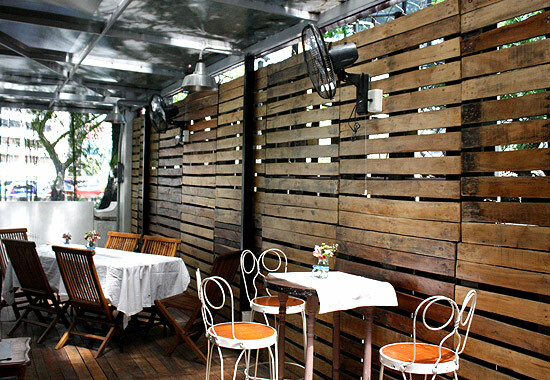 The al fresco platform is the perfect backdrop to the kind of homespun dishes that Chef Nikko makes. It’s the whole restaurant, actually. The little house on the side, cozy in the way only small spaces can be, is essentially the kitchen (where all the yummies are made), a counter (the stage for tempting cakes), and her baking school where she teaches everything from cakes to macarons. 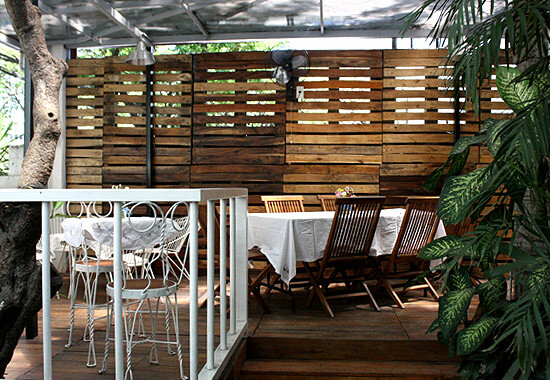 The Buendias' inadvertent home in Makati isn't just the place for kicking back. You learn a little something too.